Combining toughness with beauty, Tifway 419 has been the most popular sports turf in California for the last 40 years. The fine texture, and beautiful dark green color make it a long time popular choice for lawns, golf course tees and fairways as well. Its dense, rapidly spreading growth habit means quick recovery from injury, making it one of the most durable hybrid bermudas on the market. Tifway 419 tolerates close mowing, and is highly disease resistant. 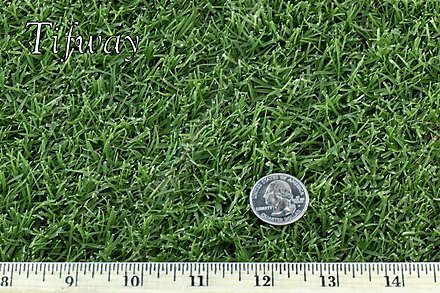 Like all our hybrid bermudas, Tifway 419 is a drought tolerant grass, and requires very little water compared to cool season grasses like fescue.